When I think of Madrid I think of hot. Hot, dry, summer temperatures. This capital of a country with over 5,000 miles of coastlines is probably farther from a cool ocean breeze than any other city in Spain. Just come prepared for the heat, plan a daily siesta, and see all there is to see in Madrid. Madrid is a walking city - everything is best explored on foot. The Plaza Mayor and Puerte del Sol are very near each other - both off the Calle Mayor - and a good place to start your tour of the town. Puerte del Sol is, in fact, the symbolic center of Spain, as so marked by the kilómetro cero, a plaque on the ground in front of the post office from which distances in the country can be measured. (I've seen these in Paris and Budapest, too.) 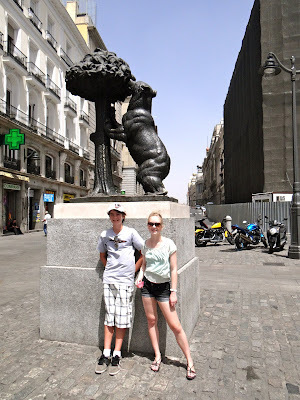 The Puerte del Sol is a busy, bustling square with a couple of landmarks such as the old post office and the statue of the bear and madrone tree. Bear and madrone tree - symbol of Madrid. A short distance away is Plaza Mayor, an enormous rectangular central plaza enclosed by residences with lovely balconies and an equestrian statue of Philip III in the center. The most notably beautiful section of the buildings is the Casa de la Panadería with hand-painted frescoes on its façade. Plaza Mayor used to be the site of bullfights and public executions, but now there are restaurants and shops and just general strolling. Tapas at Mercado de San Miguel. Madrid's Royal Palace is a stunning site to visit. Built in the 1700s, it was home to several royal families, but is now only used for award ceremonies, royal audiences, banquets, and other special events. The Changing of the Guard is an interesting ceremony for younger children especially, and it's held every Wednesday at 11:00 a.m. except in the summer months. Our family took an audioguide tour that covered the interior and exterior grounds. I love the grand Almudena Cathedral right across the plaza from the palace. In the courtyard of the Royal Palace, Madrid. Almudena Cathedral, as seen from the palace courtyard. Chandelier in the Royal Palace. When temperatures soar in Madrid, a nice place to cool off is Retiro Park at the edge of the city center. Shady and wooded, this park offers relaxation as well as activities. There are play structures for children, free summer concerts on Sundays, street performers and puppet shows. Rowboats can be rented and paddled around in the large artificial pond next to the spectacular King Alfonso XII monument. Large semicircular collonnade monument to King Alfonso XII. For a late afternoon snack while walking around town, pick up some convent cookies from Convento de Corpus Christi or take a coffee break at Chocolatería San Ginés, the most famous churro bakery in Madrid. My husband and I attended a bullfight at Madrid's Plaza de Toros many, many years ago, and although we appreciated the cultural beauty of the art, we were mortified when the dead bull was dragged out of the arena. Still, my kids insisted they wanted to see a bullfight. Fortunately or unfortunately, there weren't any scheduled when we were in Madrid. You can check performance dates and buy tickets here. We liked taking evening walks around Madrid's Parque de la Montaña, where you will find - of all things - a 2nd century B.C. Egyptian temple that was gifted to Spain in the 1960s. At this park you can also enjoy brilliant views of the Royal Palace at night. Beautiful Pictures! 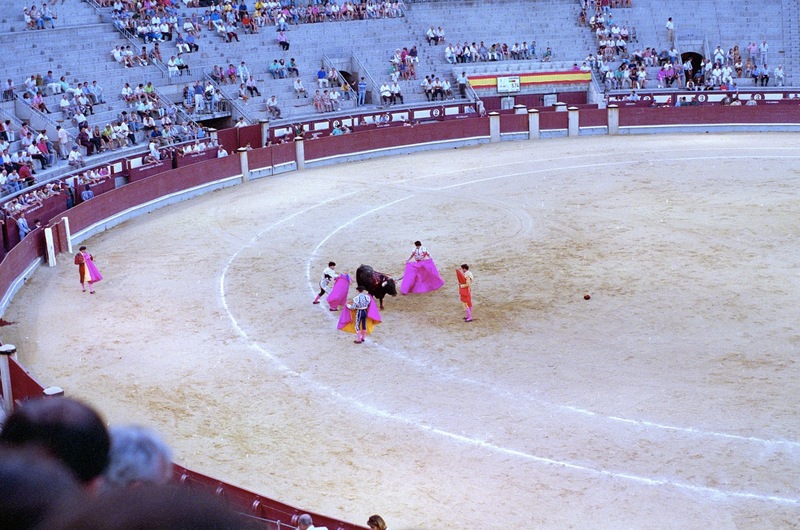 I never managed to go into the Palace and see the bull fighting, so perhaps another trip to Spain is in order! Gorgeous photos. I don't think I'd want to see the bullfight after that either. We loved Madrid! It holds special memories as the first European city my kids visited. You brought back so many wonderful memories through these beautiful photos. I'm still dreaming of those churros con chocolate. We passed on the bullfighting too. Lovely pictures. I should make a trip to Spain .